When three unsavory characters in a bar in Port Elizabeth, South Africa, overhear some crewmen mention that Captain Steve Cutter, skipper of The Shark, is carrying a fortune in diamonds, they beat up the crewmen, steal their clothes, and get hired on as their replacements. Three days out at sea and the new crew stage a “Mutiny!” sending Cutter off on his own in a lifeboat. No one can find the diamonds, and when the sea is calm Cutter sneaks back aboard and quickly dispatches the scurvy dogs. After they’ve all been knocked overboard, he reveals that the diamonds were hidden in a bag of flour, the only food item that the baddies had tossed into the lifeboat. Yawn. This is straightforward sea action stuff, made bearable only by Johnny Craig’s usual artistic flourishes and his fine use of wordless panels to tell key elements of the story. Peter: In 1950, Harvey Kurtzman convinced Bill Gaines that an adventure book would be a great idea. Two-Fisted Tales was born. 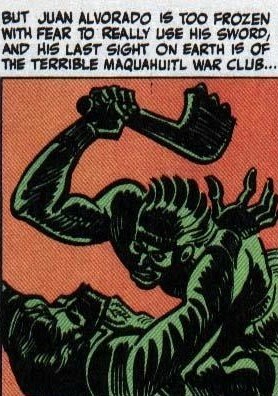 According to a transcript (published in the 8th issue of Squa Tront, 1978) of a panel on the war titles at the 1972 EC Convention in New York (featuring Gaines, Kurtzman, George Evans, Wally Wood, Jerry De Fuccio, Will Elder and Jack Davis), Al Feldstein edited the first issue but then Kurtzman took over with the second, making it as much his title as Robert Kanigher did Our Army at War for DC. 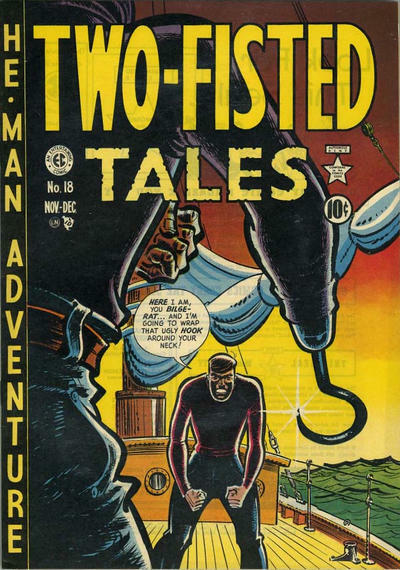 Initially, the focus of TFT, as you can see when you read the stories included in the first issue, was a large canvas (at the aforementioned war panel, Gaines referred to the early issues of TFT as "blood and thunder tales and rip-roaring adventure") but that canvas was narrowed very soon to just war stories. The first issue features two obvious stand-outs, "Conquest" and "Revolution." The former is a violent slice of history while the latter is an atypical brothers-in-arms tale with more characterization in its six pages than some novels can claim in hundreds. Both come equipped with downbeat endings. The numbering, by the way, continues from The Haunt of Fear. Say what? Yeah, I know. This one's almost better off not being explained but suffice to say, funny book publishers had to file with the post office in the old days and those forms probably cost eight cents to file so... You get all kinds of wonky numbering systems. Like Tales from the Crypt (and unlike, say, The Haunt of Fear, the numbering won't backtrack. Jose: For all of its one-dimensional characterizations, “Conquest” was easily the highlight of this issue for me. It’s kind of funny, because where one might expect Johnny Craig’s clean-cut, efficient art to work really well in an action-oriented series, I found his contribution incredibly plain and lackluster when stacked against the abundantly stylistic art of Harvey Kurtzman. Like in Wood’s story, you can feel the rage and sweat and blood coursing through Kurtzman’s characters, giving it more of the thick, machismo punch that the reader would hope for in a series entitled Two-Fisted Tales. Like Jack says above, Feldstein’s story is as clear an example of time-travelling as anything we’ve seen from the SF titles. Its blatant racism is matched only in its amount of hilarious earnestness. John: This was my first time dipping my toes into TFT, so I was quite surprised to find just how few of these initial stories aligned with my expectations for cigar-chomping, steel-jawed hero war tales. As I read through the issue, I was actually excited by the thought of broader action/adventure tales, as I don't know if I can maintain enthusiasm for a steady diet of war stories. 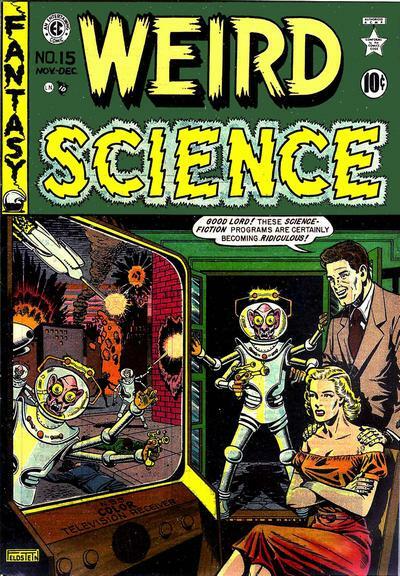 Unfortunately, none of the stories in this first issue would have lured me back for more. From Feldstein's splash page, I thought "Hong Kong Intrigue!" might prove to be an interesting (albeit racist) period adventure tale, but the story was uninspired. "Revolution!" was forgettable other than the ending, though the story itself was closest to what I had come to expect from the book. "Conquest" read like a heavy-handed history lesson, and "Mutiny," while having the most recognizable classic EC twist, suffered from the all-too common lengthy build-up to a lackluster payoff. 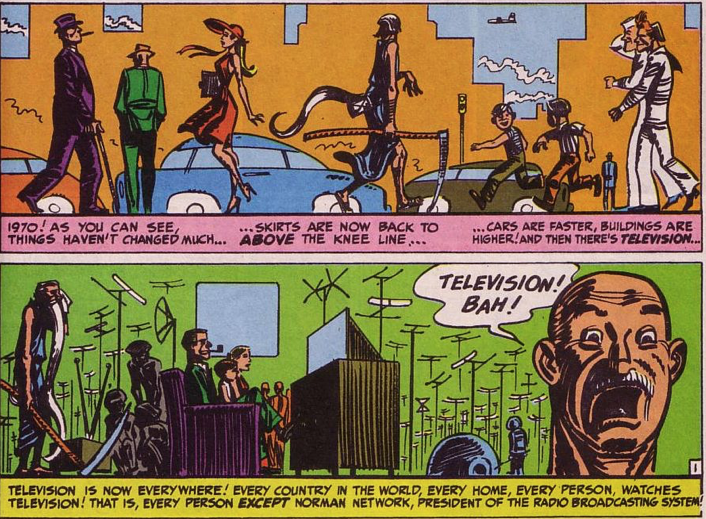 It’s 1970 and everyone in the world is captivated, no, obsessed with television. Everyone, that is, except radio station magnate Norman Network. Norman can’t seem to get his head around why so many people find the tube fascinating. With his station revenues falling to an all-time low, Norman devises a plan to rid the world of TV. He hires a scientist to travel the world in search of any disease that can be linked to television viewing. 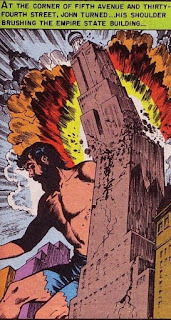 The scientist discovers that TV can lead to disintegration and, for a time, Norman wins his battle. It’s only in the end that Norman discovers that humans watch TV in order to disappear (literally) and he’s very soon the last man on earth (and without a TV, to boot). 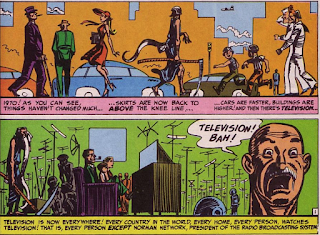 "The Mysterious Ray..." is prescient satire in the Kurtzman style. 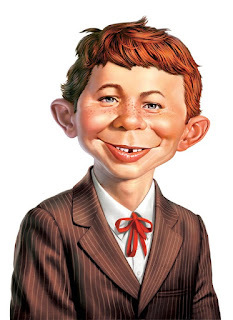 Could very easily have found a place in MAD Magazine a few years later. John Clayton, the brilliant scientist of "Second Childhood," makes simultaneous discoveries: he finds the key to halting the aging process just as he realizes his assistant, Betty, is a hot babe. Since he's "twice her age," the scientific breakthrough couldn't have come at a better time. 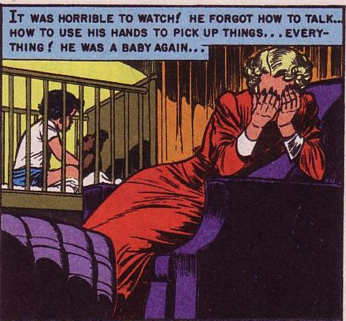 Unfortunately, the serum reverses our hero's aging process rather than halting it and he regresses, by the climax, to an infant looked after by the same babe he'd hoped to marry. Kamen's art is perfect here since every panel is filled with talking heads and little else; let's just say Jack wasn't taxed with the layout. Al Feldstein presents a decent science fiction concept but then doesn't know where to take it, climaxing with a silly panel of Betty, feeding John a bottle and pleading with the reader to help her find a solution. The story is evocative of Richard Matheson's The Shrinking Man (which wouldn't be published until 1956) but lacks that novel's powerful denouement. Two space travelers rocket from Earth on a voyage to Alpha Centauri but accidentally enter a time warp and end up back on Earth one million years later. "A Trip to a Star!" makes me nostalgic for the days when astronauts could travel the length of the universe dressed in James Dean shirt and trousers. Perhaps the story comes across as predictable because we've seen so many "Oh My God! We were on Earth the whole time" dramas in the meantime. The only thing missing here are damn dirty apes. Jack: I like the Kurtzman story best. His art works for me when the story is tongue in cheek, as this one is. It’s yet another story about TV and very funny, and I particularly like the ending where we don’t get any explanation of where everyone went or why. Feldstein’s story is also very good—strong art as always and a clever, original story. The best thing about the Kamen story is that it’s told from the woman’s perspective, as she goes from the young doll to the unhappy mother. Woody is always great with spacemen and the mystery in the last tale held my interest. Overall, a very satisfying issue of sci fi! Jose: Kurtzman easily serves the most enjoyable entry in this issue, his delivery just over-the-top enough to elicit hearty chuckles from the reader. I also appreciated the fact that the “wonderful world” the TV viewers disappear to is left entirely up to our imaginations. 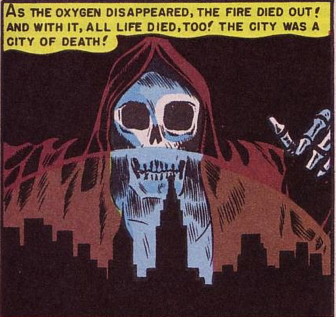 “The Last City” really starts picking up steam once the force field over New York becomes impenetrable, the situation delving into some pretty grim realities that would’ve come as a shock to young comic book fans. It’s all explained by Feldstein in a detached, documentarian style that adds exponentially to its unsettling effect. “Second Childhood” has probably been my favorite of Jack Kamen’s SF stories so far. Faint praise considering some of the material we’ve put up with, but I found the premise to be quite engaging, especially when our put-upon heroine is forced to deal with the psychological demands of disassociating John as her husband and begin looking at him as her child. (Paging Dr. Freud.) 1950s propriety undoubtedly kept the climax of the infantized-John “demanding food” from getting too discomforting. Wood’s art is always a joy to behold, but the warmed-up leftovers of the plotline to “A Trip to a Star” guarantee that you can skip over the words here. "A Trip to a Star"
John: I enjoyed "The Last City," which had me thinking about Stephen King's Under the Dome, and particularly how he specifically allowed for air to pass through so as not to kill off everyone trapped inside relatively quickly. While I do love the classic bubble-canopy flying saucer (which flips open to make getting in and out easy), the Saturnites themselves look too dorky to be tooling around in such a hot rod. Once you get past the silliness of the concept, "The Mysterious Ray From Another Dimension!" is quite poignant, striking chords similar to Invasion of the Body Snatchers and even a bit of Michael Tolkin's The Rapture (and let's face it, who can deny that GOD is television?). I wasn't as impressed by "Second Childhood," and think it would have been more powerful (and far more creepy) had John not just forgotten things as he grew younger. I guess they weren't prepared to suggest (let alone depict) the husband in a young boy's body sleeping with his wife. Kudos to "A Trip to a Star!" 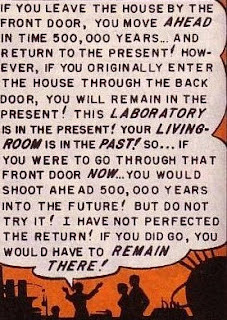 for NOT delivering the obvious, "we're on the post-apocalyptic Earth of the future" denouement. That said, I also found it amusing that on their trip out of our galaxy, they timed it accordingly so that all of the planets were in alignment on their path at the right time. My favorite bit was the off-hand reference to the 'quick test' to confirm the air was breathable on the foreign planet where they landed. Roger Compton is walking through the village square on a dreary afternoon when he is met with the sight of panicked townspeople running through the streets. They warn Roger to hide, for “The Hunchback” is on his way! He’s surprised to discover that the miscreant in question is his old college chum, Peter Golgo, but any chance of a happy reunion is snuffed out when the half-crazed Golgo shoos Roger from his crumbling house. The villagers whisper stories of the recluse desecrating graves in order to feed on decayed flesh, but Roger puts it all down to superstitious hogwash. Consulting with the local M.D., Roger is related Golgo’s tortured history, the most shocking revelation of which is the fact that Golgo’s deformed back is actually the sentient remains of a Siamese twin that was never removed at birth. Compelled by the pain-inducing monkey on his back, Peter has been forced to feed his brother’s unholy appetites, but a final altercation takes place just as Roger returns to the house, his late intervention revealing Peter, his throat torn out by Li'l Brother, and the evil twin dead from the cessation of their shared heart. On paper, this story seems like a bona fide winner, a more fitting introduction for “Ghastly” Graham Ingels to The Haunt of Fear, the magazine that would soon host him as lead artist, than either “The Killer in the Coffin” (#16) or “Monster Maker” (#17), but the promise held by the tale’s logline is dampened by a surprisingly lackluster turn by the artist. Which is not to say that the art here is bad, not by a long shot, but Ingels seems to demonstrate a level of restraint that leaves the reader’s—ahem—appetite unsatisfied. His faces are still things of beauty, but when I think back to the scenes of the grave robbing and the final unveiling of Peter’s “monstrous” brother, I can’t help but wonder what could’ve been wrought had the artist pushed the envelope just a little more here. Suffice to say, we’ll see Ingels master his particular aesthetic sooner rather than later. There are definitely some interesting ideas at work in “The Tunnel of Terror,” yet I honestly can’t say if the tale ever quite clicked for me. The switch to a more exotic backdrop was a nice change, and the fact that we’re never quite sure what is going on—Is there really a monster on the loose? Is Linda’s brother dead? Is she crazy?—is a commendable balancing act other stories have hardly attempted to accomplish, yet I find myself uselessly wishing that the freaky underground nightclub angle had been explored a little further. I’m convinced that the ending could’ve been great had Kamen not dropped the ball with those last few panels. It sure is nice seeing good ol’ boy Jack Davis starting to wave his freak flag and pound the drum of delirium in “The Living Mummy.” The two-week-old casserole story isn’t much to stand for, but it says quite a bit about Davis’s talent that he manages to make almost every panel spark with momentum and kinetic energy. 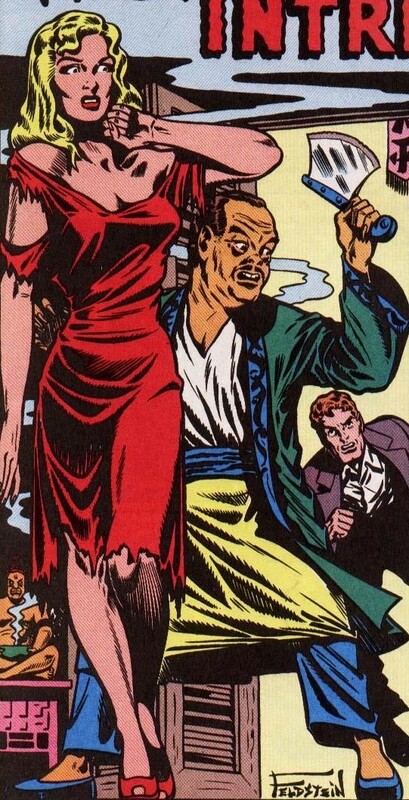 Could you imagine what reading this would’ve been like had it been drawn by Harry Harrison? Davis was one of the artists most adept at action (not to mention those marvelous bug-eyed, ditch-mouthed, screaming faces), and it shines through even in this sophomore credit. 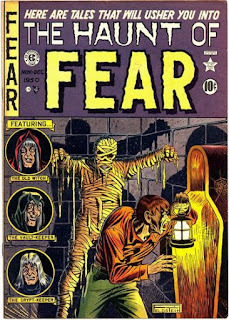 Peter: Al Feldstein checks another two boxes on the list labelled "Classic Monsters" with "The Hunchback" and "The Living Mummy." These join the previously published "Vampire!" (from HoF #16); "Zombie! (Crypt of Terror #19); and "Werewolf" (Vault #14). "The Living Mummy" is the first EC work for Jack Davis, who will fast become one of the EC fan-addict favorites. Not one of the four stories in this issue feature a "shock ending"; all just sputter and fade. Two of them, "The Hunchback" and "Man from the Grave" even telecast their "twist" endings long before their climax. Jack: Yes! “The Hunchback” is the kind of gross and disgusting story I’ve been waiting for! Welcome to the real Ghastly! “Man from the Grave!” also pushes the envelope of bad taste, as Wood treats us to some horrific images. There’s a great panel where a little girl watches a coffin be carried by. It’s chilling in a quiet way. Kamen’s story would have benefited from a more gruesome finish (and a different artist). Davis’s story is his first for EC and it shows, but I’m thrilled to finally be seeing work by one of the EC greats. John: As I read it, I couldn't help but wonder if this particular issue of HOF was read by and made a lasting impression on a 10 year-old George Romero (who has always credited EC comics as an inspiration--to which he wrote a wonderful love letter with his film Creepshow). Devout Night of the Living Dead fans like me cannot help but notice a number of interesting if coincidental similarities spread across the stories within: we've got flesh eating ghouls ("The Hunchback! "), a quite possibly dead brother attempting to eat the flesh of his sister ("The Tunnel of Terror! 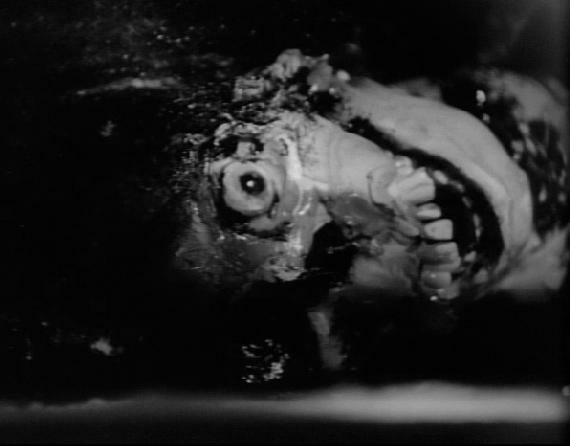 "), as well as a walking corpse PLUS a face missing flesh, revealing the skull underneath ("Man from the Grave!"). 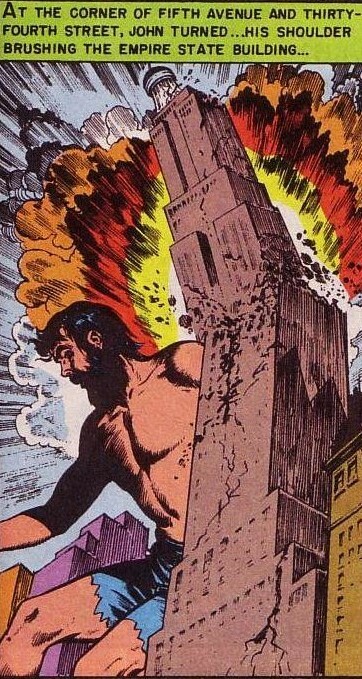 Perhaps it's just me, but I'd love to put this issue in front of George to see if it brings back memories. As for the stories themselves, I was pleasantly surprised by both "The Hunchback" and "The Tunnel of Terror!" though in both cases I was disappointed that the the climactic moment either happened off-screen or the story ended abruptly before things got too nasty. 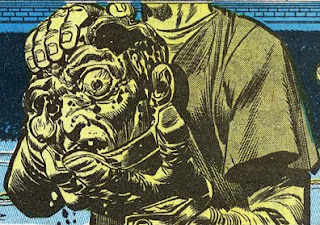 Wally Wood's art in "Man from the Grave!" was a highlight this issue, particularly the acid burnt face of Bill Johnson. My least favorite of the tales was "The Living Mummy!" but even that delivered a great Jack Davis shambling corpse. And it was still more entertaining than ANY of the stories in Two-Fisted Tales this month. Off the coast of Argenta, a small fishing boat drifts into the area of the Bikini bomb test, exposing Luis Martinez and his pregnant wife Rosa to a fatal dose of radiation. After Luis dies, Rosa gives birth to a boy named Pedro, who soon grows into an unusually bright little boy. Knowing she is dying, Rosa brings “The Radioactive Child!” to the office of Benito Perez, certain that only the country’s president should look after her son. After she dies in the president’s office, the boy surprises Perez’s advisers with his wise counsel and the president appoints him as the country’s new prime minister. Little Pedro tells Perez how to get his country up and running and, before you know it, Argenta is strong, profitable, and declaring war on its neighbors. When the United Nations agree to bomb Argenta off the map to stop Perez’s mad ambition, Perez approaches Pedro and demands that he tell him the secret of the hydrogen bomb. Pedro is tired and tells Perez to come back the next day. Perez gives the little boy a good wallop, which causes Pedro to revert to the personality of a normal child and lose his intellect. As a result, Argenta is destroyed and Perez is killed. We may be early in our month-by-month journey through EC comics, but so far, at least for me, Kurtzman’s work is a real revelation. This is a powerful story whose message still resonates 65 years later. 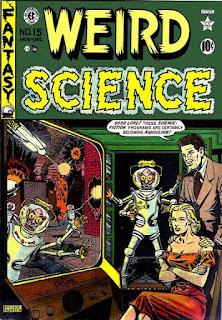 Al Feldstein’s “Panic!” starts out seeming like a tired retelling of the story of Orson Welles’s 1939 radio broadcast of “War of the Worlds,” but takes it one more step when a re-enactment of the show coincides with a real invasion, one that listeners laugh off as a hoax until it’s too late. Graham Ingels turns in very smooth art on “House, in Time!” which reads like it could be a swipe from a Ray Bradbury story but ends suddenly and unsatisfactorily. Last of all is Kamen’s “I Created a . . . Gargantua!” where a poor fellow is made to keep growing and, as usual, the scientist who assured him he could stop the process finds he cannot. Peter: "I Created a... Gargantua!" is proof that EC didn't reign supreme over every comic book genre. I'm not sure if it's Feldstein's silly script or Kamen's big-eyed gosh-wow art that did me in but it's easily the low point of a very good issue. Kirby and Lee would revolutionize this sub-genre in the late 50s and early 60s. "House... In Time" is built around a fun gimmick but it's far too wordy (one panel is pretty much all text with the art squeezed down at the bottom). 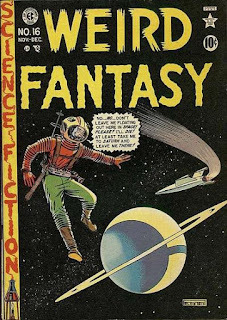 Its chief notoriety is that it's the only contribution Ghastly made to the science fiction titles; it doesn't look like the typical Graham Ingels artwork either. This was probably what led Al and Bill to keep Ingels on the grittier titles. 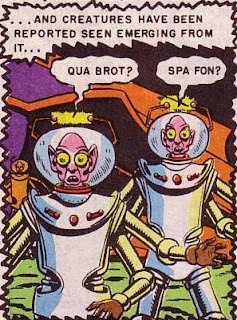 "Panic" is a clever riff on Welles's War of the Worlds broadcast and contains the first recorded usage of the phrases, "Spa Fon" and "Qua Brot" which, like "Squa Tront," became titles for EC fanzines. "The Radioactive Child" is in a whole new stratosphere all to itself, a blackly comedic dig at politics that has not dated one bit in the sixty-five years since its publication. Kurtzman's dialogue see-saws between hilarious and chilling and should be required reading in high school literary classes. Stunning! "I Created a . . . Gargantua!" Jose: It’s amazing that John Paulson—a riff on Paul Bunyan?—is able to purchase perfectly-fitting clothes even after he grows thirty feet in height. There must be a specialty “Big and Tall” store in the Big Apple that I don’t know about. Even with its slightly risible qualities, I found “I Created a… Gargantua!” to be much more entertaining than the flatlining “House, in Time.” Ingels’s art was exceptionally crisp, but the all-too-brief glimpse we get of his meat-eating dinosaur feels like a wasted opportunity and gets shoved off-stage in favor for the explanation-heavy speeches that comics of the time seemed to love so much. “Panic!” is another of Feldstein’s cheeky SF tales, neatly delivering a twist when you least expect it. And I’ll add my vote that Kurtzman’s “The Radioactive Child” is a splendid, bracing read, a story that cracks you up with its boy-genius demanding to be left alone with his comic books before ungrounding you with a grim dénouement that carries the painful ring of truth to it. out of Peter and Jack yet again! "The Hunchback" sounds like it inspired a story that really spooked me when I first read it, "The Prodigy Son" in Eerie # 40.